We live in a universe filled with weird stuff that we don’t really understand: dark matter. Physicists have observed its spooky effects but have’t seen it directly. Even scarier: There seems to be around six times as much dark matter in the universe as regular matter. Tonight, we’ll be broadcasting a discussion on this mysterious substance over Facebook live at 7:00 pm ET from the Gizmodo office. Joining me will be three prominent physicists: Elena Aprile, founder of the XENON dark matter experiment from Columbia University, James Beacham, physicist at the Large Hadron Collider, and Priya Natarajan, astrophysicist at Yale University. We’ll begin taking Facebook live questions beginning at 7:45 pm ET. Come back here once the event starts and we’ll drop the link in this post. So what is dark matter? As far as we can tell, it’s some strange amount of mass that can interact with gravity but not with the other forces of nature, like electromagnetism. We can’t see it directly, but we’ve observed the way it warps the light of distant galaxies and causes them to rotate faster than they probably should. Experimental and theoretical physicists spend a whole lot of time and have built a whole lot of experiments to try and figure out what the heck it is. We’re hosting the event as part of Dark Matter Day, which officially takes place on Halloween. 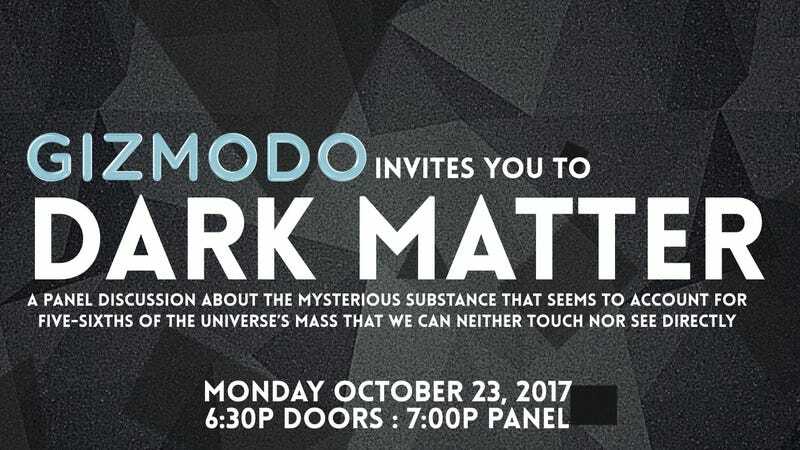 Physics communicators around the globe are hosting events to celebrate the mysteries of dark matter with the public. Check out the Dark Matter Day events list for an event near you.